Below are the companies — Acreage Holdings, Heritage Cannabis Corp. — and related events we’re tracking closely in the upcoming week ahead. It seems there was some modicum of confusion regarding Prior Sales on Acreage Holdings Listing Statement (filed November 14th). Under Section 10: Description Of the Securities—Subsection 10.7—the company lists an aggregate of 5.35 million Class A Subordinate Voting Shares sold at prices between $0.05-0.06c to an unnamed investor. Some investors—including the Midas Letter, originally—took that to mean certain insiders were receiving Acreage units on the cheap. As it turns out, that’s not what happened. After thoroughly investigating the matter, it appears the $0.05-0.06 share issuance is linked to former Applied Inventions Management Corp. (AIM) President Michael Stein. Effective October 15, 2018, Mr. Stein converted $115,000 of a $343,154 (previously announced April 27, 2016) secured subordinated voting debenture into AIM equity, acquiring direct ownership of 2,300,000 units in the process. As part of the original debenture structure, any or all of the outstanding principal or interest payments under the Subordinate Voting Debenture was convertible at the option of the holder into Units at a conversion price of $0.05 per Unit. As it happens, Mr. Stein took full advantage of that option. Thus, Prior Sales reflect the former president’s acquisition of AIM units before the reverse takeover took place. Upon the amalgamation, AIM shares were converted at a ratio of approximately 275:1 into Acreage equity, thereby rendering AIM shareholders will only ~47,000 units in Acreage (47,000 @ $25 per unit = CAD 1.5m) in total. We reached out to Acreage Holdings CFO, Glen Leibowitz, who confirmed this information to us. Therefore, any misgivings about insiders acquiring Acreage equity at pennies on the dollar are misguided. Nothing unethical or concerning regarding insider transactions took place. While some may have misgivings about the company’s concentrated super-voting structure or roll-up unit pricing (into units which make the company what it is today), we can positively confirm ultra-cheap penny issuance shouldn’t be one of them. Nobody in the cannabis industry hosts more insightful interviews than Midas Letter Founder James West. While all of them are interesting to various degrees, occasionally, a catalyzing interview comes along which particularly wets the pallet. Clint Sharples: “… But yeah, there’s an absolutely monstrous amount of hemp coming our way. Part of what PureFarma had which was really interesting to us was a long term agreement with 1,600 acres (pause). If you think about that in terms of size, that’s a massive amount of hemp. James West: Yield of biomass per acre roughly? Clint Sharples: “… But you could probably be safe somewhere in the 50 kg range per acre. James West: Ok, so. 1,600 times 50 (stutter) kilograms is 80,000 kg. Now 80,000 kilograms takes roughly that ratio of 6:1 to create extract from that? Clint Sharples: Yeah, it again depends on what your producing and how efficient it is. Internally we use the number 8:1; we’re always conservative with what we do…. Yeah, so when you look at it that’s 10,000 kilograms of oil. James West: So 10,000 kilograms of CBD—exactly—and now what’s the going price for CBD concentrate? In other words, the company expects to procure revenues of $40,000/kg by churning out CBD oil concentrate once it receives the proper licensing to receive hemp supply. That doesn’t appear far away, likely rolling-in at the end of January or beginning of February. Furthermore, the company claims to have “many options” to sell product in B.C., Canada, South America, and Europe, where the company sees “a massive amount of demand happening in Europe right now.” Irrespective of whether international markets open up, the severe domestic CBD oil shortage should provide ample market opportunities for the foreseeable future. Canadian LPs are still months away from generating adequate dried flower supply, let alone oil. 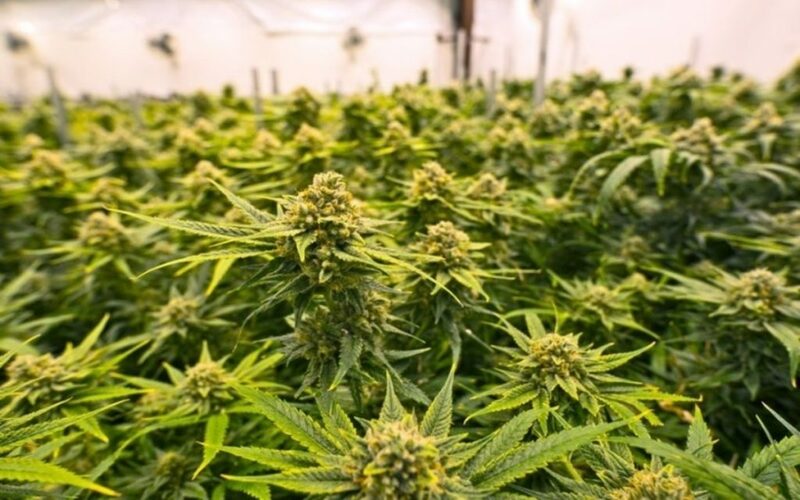 Heritage Cannabis is in the later stages of completing its acquisition of PureFarma Solutions, a specialized extraction company with proprietary extraction processes and long-term supply agreements with Saskatchewan farmers to grow hemp. We leave to others to determine the credibility or investor-worthiness of Clint Sharples’ plan. But there appears to be a strong top line story and actionable investment thesis should Heritage Cannabis execute. Valued at $66.74M on a fully-diluted basis, there’s room for upside should Heritage seize advantage of this window of opportunity; that is, convert massive hemp crops into CBD oil and bring it to market as required. Should that come about, who knows what kind of branding presence the company can establish. A couple days into the Canadian post-legalization period, we noticed a nascent trend taking place: American cannabis stocks were materially out-performing their Canadian brethren. While nobody could draw conclusions based on a ↑4.03% disparity between U.S. 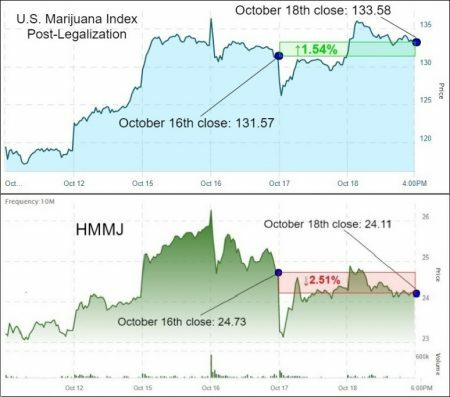 Marijuana Index and Horizons Marijuana Life Sciences Index ETF (HMMJ) over two sessions, we believed that “being overweight U.S. equities is the right side of the trade“. Turns out, that was correct. Although both cannabis classes have been post-legalization losers, there’s no doubt that a structural shift has transpired. We now have the benefit of additional price data to prove it. Since the October 16th close, HMMJ has declined ↓27.27% versus a ↓14.88% loss for the U.S. 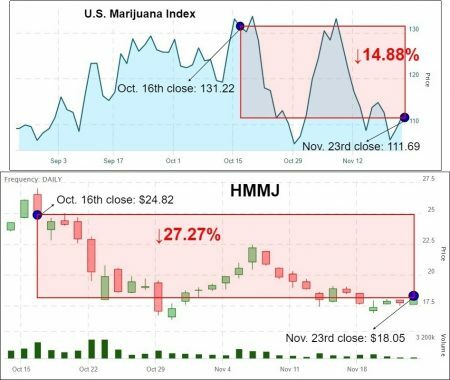 Marijuana Index—a spread of 12.39%. And lest you believe bullish results via several state cannabis provisions coming to ballot November 6th artificially inflated the numbers, think again. In the following trading session, HMMJ actually outperformed the U.S. Marijuana Index ↑8.13% to ↑3.64%, respectively. The market did not afford a post-ballot premium to U.S. cannabis stocks, despite such companies becoming direct beneficiaries of the results. Granted, the U.S. cannabis hasn’t had its ‘Canopy Moment’, when it became clear revenues wouldn’t meet lofty forward valuations afforded to the company. GMP Securities subsequent revenue downgrade was really one absorbed by the entire sector. But perhaps that was—and continues to be—the point. Unshackled by immense expectations to deliver on forward-looking expectations now, and with seemingly more legislative/regulatory catalysts upcoming, U.S. cannabis stocks continue to enjoy a precipitous investment edge over their northern peers. With U.S. reporting season starting tomorrow, positive collective results will only reinforce that notion.